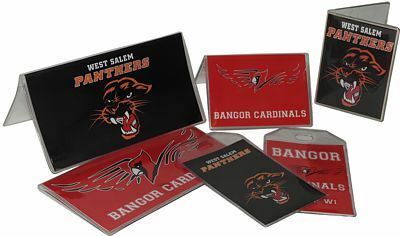 These custom made pocket calendars, checkbook covers, debit card holders and luggage tags are made with quality vinyl and are sure to help you reach your fundraising goals. Using your logo or company information not only raise money for your organization but advertises for you. Pocket calendars have been a great fundraiser for many years. Your cover design can be either hot stamped or printed. 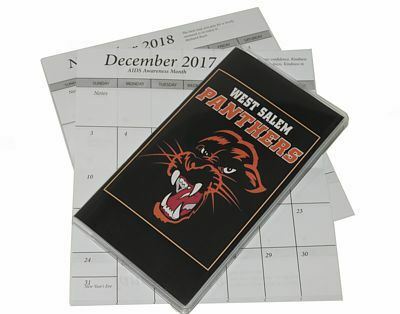 The back can feature any information you would like, such as, team schedule, discount coupon, address information or history of your group. Click Here to Email Us or Give Us A Call to Place a Custom Order! 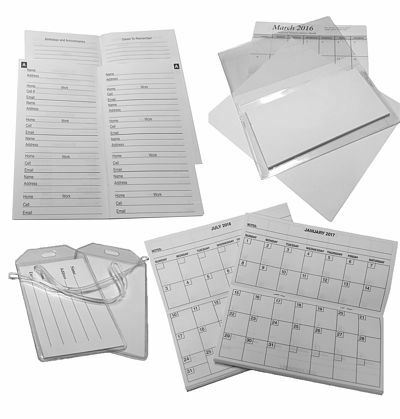 These custom made pocket calendars, checkbook covers, debit card holders and luggage tags are made with quality vinyl and are sure to help you reach your fundraising goals. Using your logo or company information not only raises money for your organization but advertises for you.